Home / Asia / International / Travel and Living / Male island (Maldives) City Tour and Places to Visit! 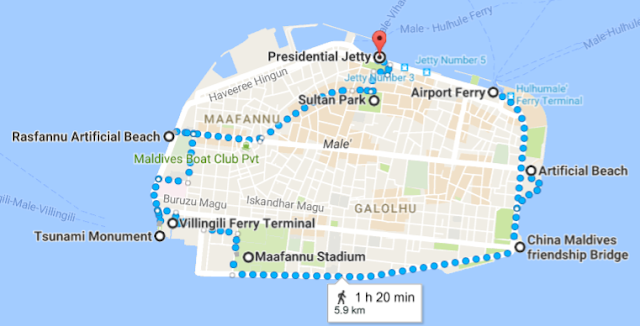 Male island (Maldives) City Tour and Places to Visit! A small and safe beach for city residents to take a quick dip. Locals, including women and children use this for quick refreshment. No match to natural beaches in other islands. A small tower raised in memorial of 2006 Tsunami victims, located near Villingili ferry terminal. It has 108 steel rods, representing 108 people who died in the disaster. The varying height indicates different ages. 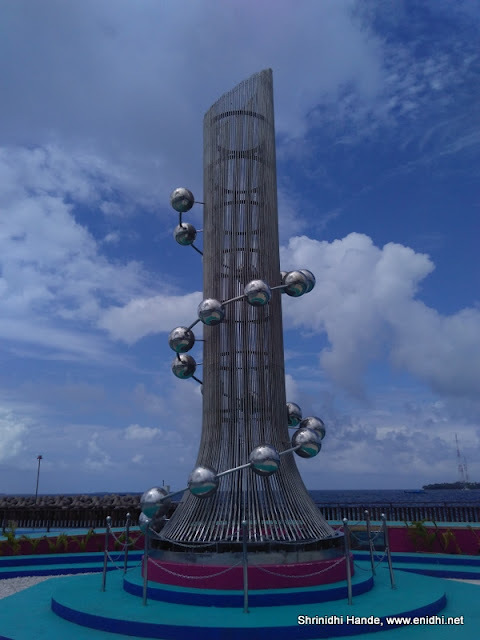 The 20 balls around it represents the 20 main islands (Atolls) of Maldives. The difference in colour of ocean water was interesting to watch. This seems largely because of sands/stones in the ocean bed closer to the shore. This is probably the most exciting part of Male city to be in- calm and cozy portion of the town. It has provisions to take a shower, place to sit and relax and a small artificial beach should you wish to take a dip. Right next to the Sultan Park is the open area (known as Republic Square) that houses a tall flag post, a jetty. Here you can feed pigeons or take a look at various boats and yachts parked. There is also a National football stadium in the heart of city and Maafannu stadium. (Tender coconuts are available near this stadium, 20-25 MVR). Below map gives you an idea of location of these attractions. If you notice, entire circumference is about 6 kms. Best way is to begin from one corner and explore them all on foot at your convenience. Taxis keep running, so you can hail one if you wish to. Check this post for complete list of activities you can do in Maldives. never heard about this place, good to know...its so beautiful!!!! Why so many artificial beaches? Very new for me but a beautiful place to visit . @Yogi & Jyotirmoy- Well, these are not the most beautiful parts of Maldives. People go there to stay in resort islands. Artificial beaches are safer that the real beaches with high waves/deep ocean. For kids and other residents who need a quick dip, artificial beaches are safe and convenient. Of course there are many natural beaches too..